HOUSE FLIPPING IN N. VIRGINIA DO YOU HAVE WHAT IT TAKES? Is it the right time and how can I house flip in this area? 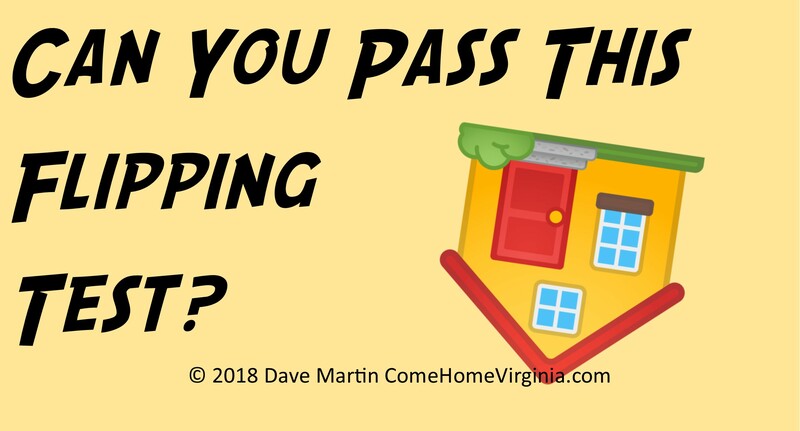 This last question how to flip a house depends much more on you and how you are prepared mentally, psychologically and financially than you may have realized. "Ummm, I'm not sure about that countertop. Shouldn't they be hiring someone to do that? I would do such a better job on that flip." Who hasn't said that? When it comes to flipping, we all think we'd be naturals, right? Or at least more skilled than the novices who are fumbling through it on TV. But it takes more than big dreams and good intentions to execute a successful flip, and with so much money at stake, you want to make sure you do it right. Actually, you want to make sure you're right for flipping in the first place before you put your financial future on the line. Take the house flip personality test to make sure you're a fit. No one's really going to answer, "No," to a question like this, but put it in the context of flipping. If you think it's easy money and you aren't really looking to put in the sweat equity or follow the basic rules of flipping, you might want to move along. "Don't believe those late-night infomercials that say you can get into house flipping with no money," said U.S. News & World Report. "Nobody is going to hand you a house for free, and you can't go to Home Depot and they'll give you your supplies for free. If you are using credit cards and have no money, you can get into trouble quickly." Buying a home just because it's affordable and in need of renovation is not a great strategy. People actually have to want to live in the area where the home is located. Paying attention to hot areas can help you pinpoint the right spot. You also need to pay attention to the home's proximity to your home. Trying to manage a flip from afar is hard even for the most experienced investors. You may have the greatest personal style in the world, but, when it comes to flipping, you want to make sure you're making the right choices to bring you the most money. Likewise, you may have your eye set on some specific updates and upgrades, but adding in what you want, and not what buyers are looking for, may make your flip a flop. "Know which home improvements increase the home's value," said Money Crashers. "Focus on these projects first. Home improvements that increase the value of a home might include upgrading kitchen appliances, repainting the home's exteriors, installing additional closet storage space, upgrading the deck, and adding green energy technologies. On the other hand, avoid home improvements that won't increase the selling price, like installing a pool, installing a whirlpool bath, or adding a sunroom to the house." Smart planning, extreme organization, and a great, trustworthy team are all crucial to a successful flip, obviously. But if you're the type that flips out (literally!) if something changes, goes wrong, or looks like it's all about to fall apart, this might not be for you. Flipping is a roller coaster, and there are going to be frustrations and setbacks along the way. Accept it, deal with it, and move on. Is this a get rich quick thing or are you thinking of flipping as a career? Are you interested in doing quality work or is it just about making the place look good and getting out? Being honest about your goals will help guide you throughout the process, but keep this in mind: cut corners and shoddy work may save you money upfront, but may impact your bottom line. And, if you plan to flip more than just one home, you don't want to earn a reputation for sketchy work. Even if you're the DIY King of North America, you're going to need help somewhere, at some time. The best flippers have a contractor they can count on and assorted other trusted professionals for plumbing and electrical, landscaping, appraisals, title insurance, and so on. We can help you to connect to great local contractors that have earned their reputations for quality and fairness. Flipping is going to cost you, even if you find the magical lipstick on a pig house. And many people underestimate the potential costs, from the down payment to the carrying costs if it doesn't sell right away. "To get a conventional investor mortgage, you often need at least 25 percent down, though a good mortgage broker might find other options, including a lower down payment or a loan that provides some money for repairs," said U.S. News & World Report. "Hard-money lenders will lend to nearly anybody, but interest rates are high. Another major key to success as a flipper is accurately estimating both cost and timeline. That doesn't mean there won't be surprises, but you want to calculate the true cost of getting the property ready for sale. When you buy a home, you don't always know what's behind the walls: mold, asbestos, water damage, antiquated electrical lines, foundation issues or crumbling plumbing pipes."